Quaint and Quirky: Fashion Week! Over at Sense and Sensibility, they have a feminine dress week once a season. This is the week! I did a baaaaaad job of taking pictures during the summer week, but I'm committed to this one! My outfits this week will feature skirts or dresses, which are my favorite things to wear (and fleece pajamas). ~My skirt is from Ann Taylor Loft and I got it several years ago for a STEAL! I almost feel guilty about how cheap I got it. I mean some poor cow somewhere died for me to buy this skirt at an unspeakable price. Poor cow! ~The sweater is from Target. Love Target. ~The underneath shirt is from The Limited and it is gorgeous, but I burned it with the iron and ruined the lace, so now it has been delegated to undershirt. Your outfit is so pretty and feminine! I agree with Beth, those boots are fabulous! 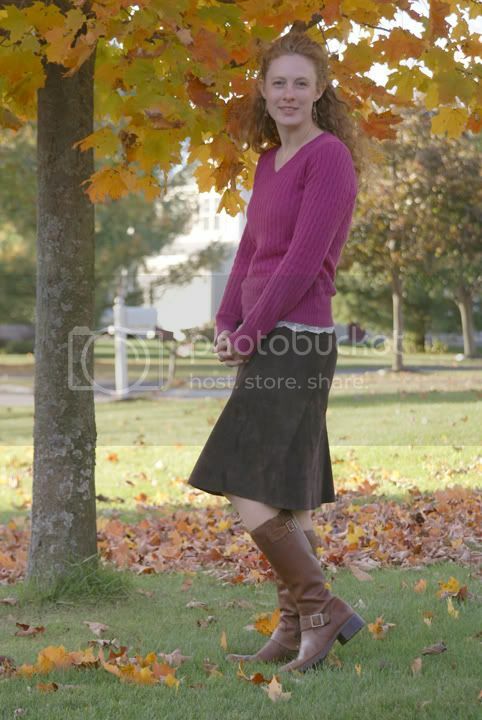 You are very much dressed for the season, even your hair appears to match the leaves of the tree behind you. I love your outfit! I'm a big fan of the equestrian look, too. I used to ride when I was a young girl, and seeing the style always brings back such fond memories. OK, Seriously?? You are just too cute! 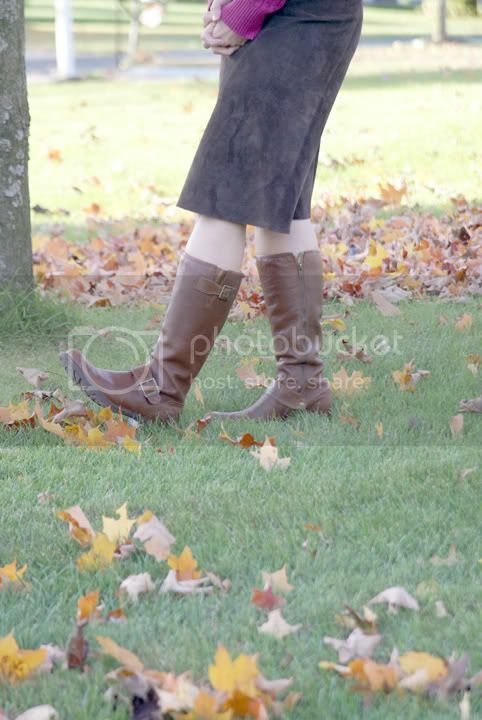 Lovely photo of you and cute outfit...I have similar and I live in my brown boots in the fall/winter.